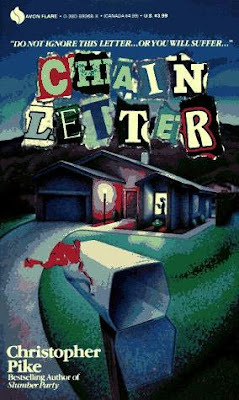 My strongest Christopher Pike memories revolve around the book Chain Letter. I only became aware of the author in the sixth and seventh grades, and since I'd yet to begin my horror phase, I never got around to reading it. Basically everyone else did, though, and as a result the book hung around my classroom for almost an entire year, shifting from desk to desk, the cover art profoundly creeping me out. So now that I've finally read it I've got to say it didn't disappoint. While it might not have been the scarefest I'd assumed it would be, it was certainly a competent thriller that moved its author up to a new skill level, and leaves me excited about where Pike will go next. There's a standard storyline that turns up again and again in these teen genre stories, and that's the old 'I Know What You Did Last Summer'. Of course the outline long precedes the Lois Duncan novel from which the title originates. It's a simple enough premise - a few teens do something unforgivable (surprisingly often this is a car accident that kills an innocent), decide to cover it up, and some time later the past comes back to bite them. While both of Pike's other novels dealt with the 'previous horror returning to haunt them' concept, in one of those situations it was a complete accident, and in the other only one person was responsible for the tragedy. The central concept that defines these stories is the idea of a shared sin that both binds the characters together and sews the seeds that will fracture the group from within. In Chain Letter the sin, is, predictably, a car accident that claims an innocent life, but where the book differs from others of its genre, and where it fundamentally interested me, is in its structure and characterizations. My absolute favorite thing about the book is the opening, and the fact that as it opens, nearly a year after the accident, everyone had gotten on with their lives. The main character Alison, her friends Fran and Brenda, local sports star Tony, his best friend Neil, class clown Kipp, and slutty acquaintance Joan are all living their normal lives as the book opens. Do they all feel bad about the time they were driving out in the desert and a man walked out in front of their car? Absolutely. But wasn't it kind of his fault for being out in the desert, crossing the road in the middle of the night? Really, what was their option other than to dig a shallow grave with their bare hands and plant him out there - is it really fair to ruin seven lives for the memory of one? This unsettlingly realistic lack of empathy makes the later device that the plot is anchored upon – the idea that the characters would risk escalating the violence being wrought upon them rather than confess is more believable here than in many similar stories because the characters have already gotten away with murder once. I didn’t have any trouble buying that they’d feel certain that they could keep the secret going a little while longer. Pike also juggles two main characters for the first time in this novel, and his increasing comfort and facility as a writer allows him to pull it off with aplomb. He even manages to work in a flashy ‘give the plot away’ kind of clue that’s placed so close to the reader’s face that they can’t help but overlook it. Yes, it’s a massive improvement over his first two novels, and my favorite so far – my only complaint is that, if anything, he went a little too easy on his characters. I’m not talking about the survival rate here, these are books for young adults, I’m not expecting an obscene bodycount or anything like that, it’s more that Pike gives them an easy out from the guilt of having murdered that guy that one time. The victim of their accident is never identified, so the characters are spared the presence of grieving relatives, missing persons reports on television, or any other realistic external forces increasing their stress levels. 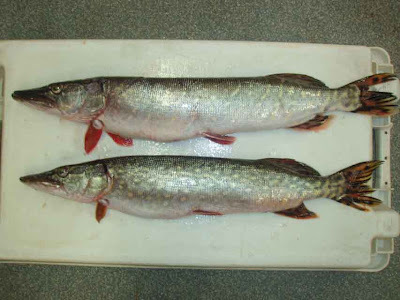 That’s right… 2 Pikes! 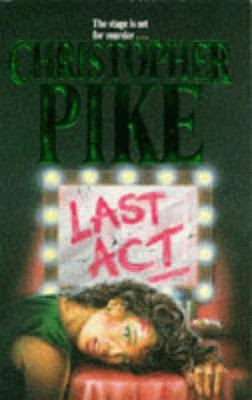 Hopefully it will keep getting better from here, as we move into the next Christopher Pike book… 1988’s “Last Act”! Yes, that’s right, we’re skipping ‘The Tachyon Web’ both because it’s not horror-themed, and because I was unable to obtain a copy.